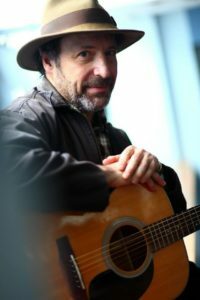 Will Kaufman is one of the world’s leading authorities on Woody Guthrie. He is the author of “Woody Guthrie, American Radical” and the forthcoming “Woody Guthrie’s Modern World Blues.” He is a graduate of Montclair State University and the University of Wales, Aberystwyth, where he earned a Ph.D. in American Literature as a Marshall Scholar. Kaufman is Professor of American Literature and Culture at the University of Central Lancashire, England, and the author of numerous books in American Studies, including “The Comedian as Confidence Man,” “The Civil War in American Culture,” and “American Culture in the 1970s.” With Ronald D. Cohen, Kaufman co-authored “Singing for Peace: Antiwar Songs in American History.” As a folksinger and multi-instrumentalist for decades, he has performed “live documentaries” about Woody Guthrie at hundreds of venues on both sides of the Atlantic.